The Irish Spring cocktail is nothing related to that overly fragrant soap. We don’t expect you to be bathing in this cocktail, however after a few too many it is always possible you might also be running naked through waterfalls. This is another cocktail with very little background to document it’s arrival and popularity. We can hazard a guess or two as to why this drink is named the Irish Spring, just based on the ingredients. Starting with a hefty pour of Irish Whiskey would easily allow this drink to be identified as Irish. 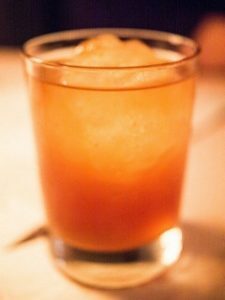 The spring in this drink must come from the fruity liqueurs used to soften the whiskey. Now instead of using the sweet and sour mix, you could go with some fresh squeezed lemon or lime juice and balance off the sourness with some simple syrup. Using fresh squeezed orange juice as well is definitely preferred, which is much better than using just an orange flavoured drink. The orange juice is going to have quite a bit of sweetness to it, so don’t overdo it on the simple syrup. Mix one of these drinks up and taste before serving. Each guest is different and will want the sweetness done according to their tastes. Add a dash of orange bitters in your Irish Spring to accent this beverage nicely.